A large-scale computational model of the thalamocortical system containing specific thalamic structures and four layers of cat primary visual cortex (V1) has been developed and simulated in the parallel NEURON environment. The model represents a simplified version of the X visual pathway for one eye to the primary visual cortex of an adult cat and consists of the three connected subsystems (see Figure 1): Retina, Thalamus and V1 model. Cells are modeled as conductance-based single compartment Hodgkin-Huxley neurons . 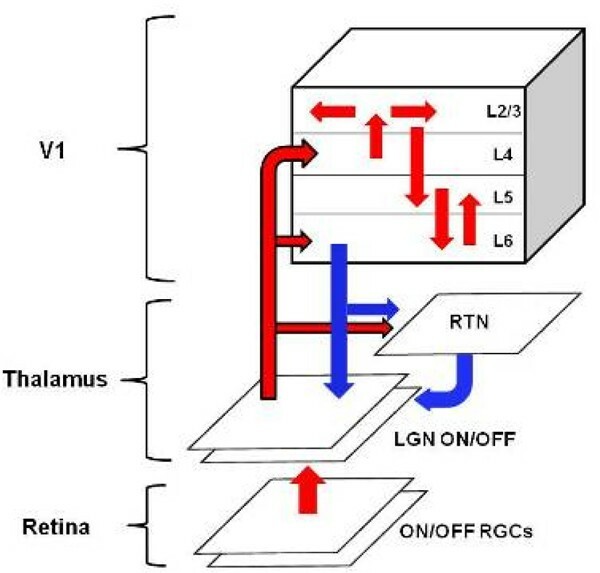 Inputs to the LGN in response to visual stimuli are generated by a reimplementation of the retina model described in . The modeled LGN consists of thalamocortical relay cells and local inhibitory neurons. Additional inhibition to the LGN is provided by the reticular thalamic nucleus (RTN) neurons, which together with the thalamic relay cells, receive strong feedback from Layer 6. The model is scaled to span approximately 1.9 × 1.9 mm2 of striate cortical surface. It is composed of ~10 000 neurons with ~1000000 connections. Connections from LGN to V1 produce an orientation selectivity map in Layer 4. The obtained orientation map is further used to infer the lateral connectivity inside Layer 2/3 in accordance with known principles governing horizontal local and long-range connections in V1 . The model is constructed from currently available anatomical and physiological data [4, 5]. The main focus of this work is to reproduce the response properties of cortical cells such as orientation preference and direction selectivity . Using large-scale numerical simulations, we also study the spacial distribution of neuronal responses across the cortical layers and examine the mechanisms and principles that underlie the efficiency of the primary visual cortex. This work  was supported by an EPSRC research grant (Ref. EP/C010841/1). Schematic of the model . The retina is represented via two layers (ON and OFF) of retinal ganglion X-cells. The thalamic subsystem consists of several layers: two layers (ON and OFF) of thalamic relay cells together with local thalamic interneurons and one layer of thalamic reticular nucleus (RTN) neurons. The V1 module contains four layers of primary visual cortex (layers 4, 2/3, 5 and 6), modeled after a restricted portion of cat striate cortex (area 17). Red arrows denote the major feed-forward excitation flow in the model. Blue arrows show the direction of major feedback from the cortex to the thalamus.